Artists: Alethea Arnaquq-Baril, James Blagden, Miguel Calderón, Anil Dash, Kevin Jerome Everson, Ana Hušman, Paper Rad, Pied la Biche, Lisa Young. Featuring: The national soccer teams of Argentina, Brazil, England, France, Germany, Italy, Mexico; Pittsburgh Pirates (baseball); Boston Celtics (basketball); Inuit high kick; U.S. Figure Skating; Mansfield Senior Tygers (high school football). Format: 16mm film, Super 8 film, and video, all screened on video. Overall run time: 58 minutes. Sports are a canvas(/screen) for personal, regional, and national projections – they are a proxy war, a fantasy, a public record, an airing of grievances, and a realm in which ideals can be realized. Sports create moments that sear into the communal memory, replaying over and over. Truncated and mangled over time, some are buried and others burnished, with glorious names like “Miracle on Ice” (hockey), “The Hand of God” (soccer), and “The Immaculate Reception” (football). The film and videomakers in A Beautiful Game get into the body, mind, and spirit—and even on the nerves—of athletes and spectators. Events are re-created with new bodies and nationalities, deconstructing techniques and refracting impacts beyond a game’s original borders. Alternatively, the final seconds of a close game are modestly documented, capturing the home crowd’s audible switch from cheerful anticipation to deflation. Time is manipulated to create an impossibly perfect match, manifesting an underdog team’s wildest dreams. The artists amplify spectators’ glee, silliness, and irreverence; provoke rival nations; and remediate sports history from fan perspectives. Athletes’ rebellious streaks are celebrated, and disciplined feats of excellence are admired. And finally, these makers visualize the part of athletes not accessible to the public—their interior state. Sports-themed cocktails, non-alcoholic beverages, and a popcorn bar will be available. Free and open to the public. Kindly RSVP in the area below to reserve a seat. 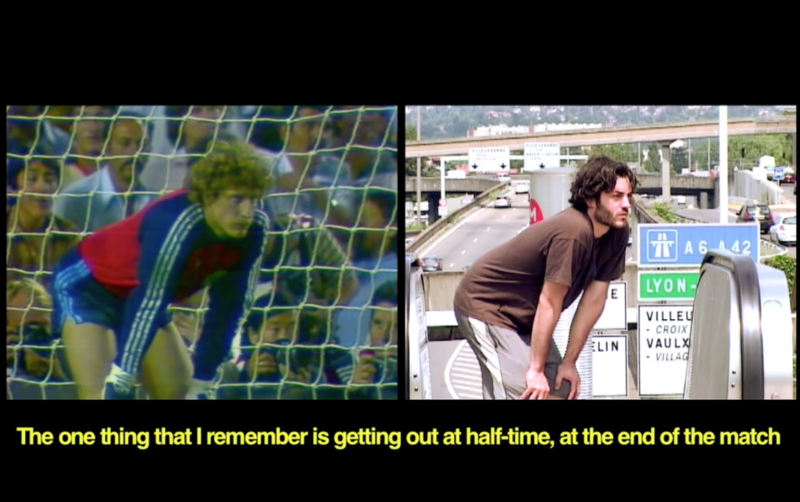 A rooftop film screening of short works that remediate sports history from fan perspectives with glee and irreverence (A Beautiful Game, Wednesday, June 27, 9-10:30pm, on the Rooftop at VisArts [in case of rain: Buchanan Room] with a popcorn bar). A discussion on Sports and Politics with Kevin Blackistone and Kavitha Davidson, with local experts. Topics may include recent protests, the realities and repercussions for athletes (both on and off-field), the exploitative treatment of Washington’s NFL cheerleaders, and other timely and local issues. (Saturday, June 23, 4-5:30 pm at VisArts, Kaplan Gallery, 2nd floor). For more information on this event, click HERE.